Ola everyone. 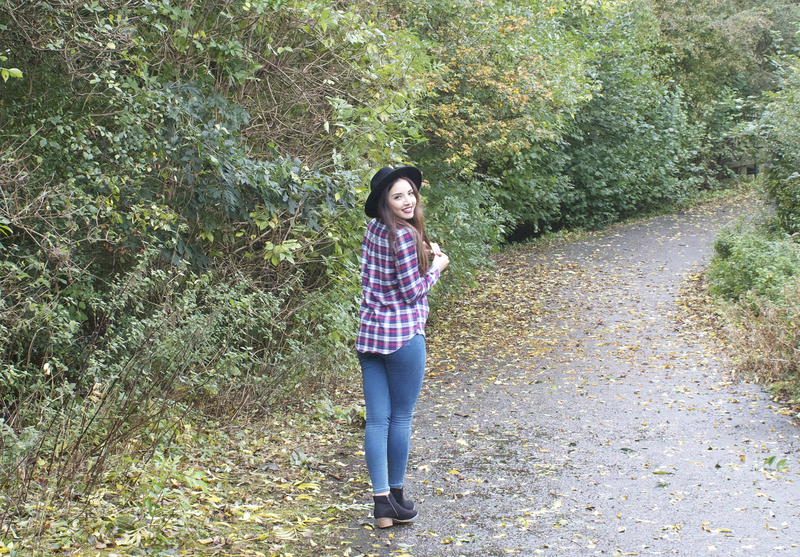 I haven’t done a little quick and easy post for you in a while, so here we are – hello! 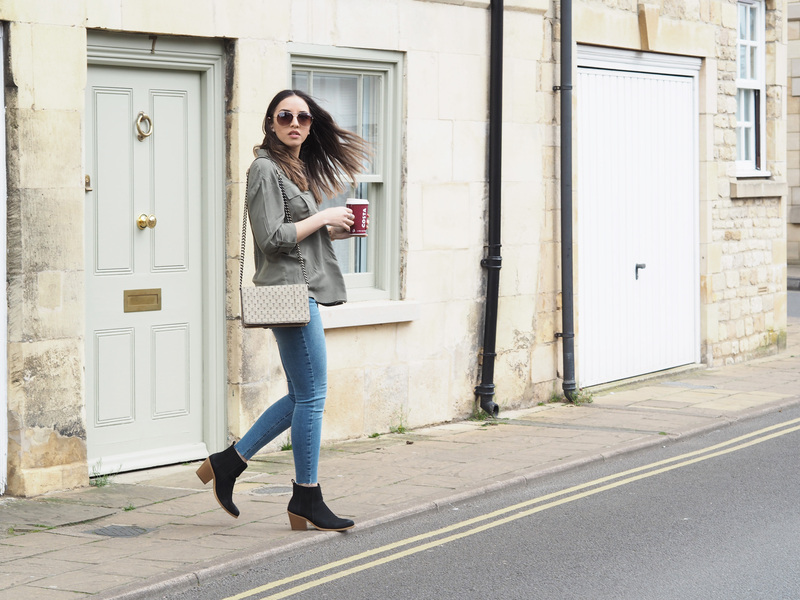 Today I’m chatting about a favourite little piece in my wardrobe – this khaki shirt from Missguided. I’ve had it for quite a few years now but it’s served me well. Although it creases at any hint of movement, I love it nonetheless and the fact that it’s so versatile just makes it one I pick up to wear a lot! 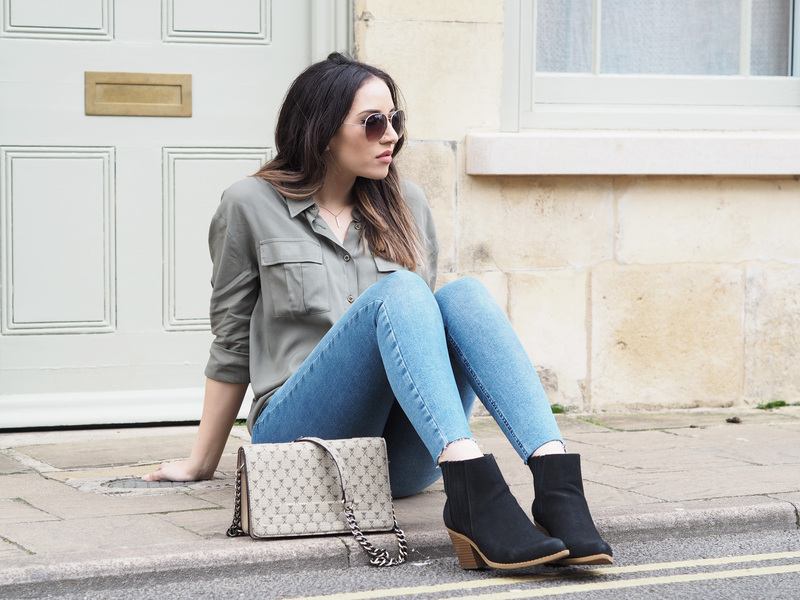 Since it was relatively sunny on Saturday, when these were taken, I opted for my new favourite Jamie jeans (Topshop, ofc) and paired it with my new love, this gorgeous Gucci dupe handbag. I have to say I’m really impressed with it so far. The print is bold and the structure is really strong, it looks and feels like much better quality than its £30 price tag. I read a blog post that sunglasses help bloggers a LOT when it comes to sunny days and outfit shoots – I get super squinty when the sun’s out because my eyes are so incredibly sensitive to bright light, so here we are, sun’s out, sunnies out! Expect to see that a lot more over here guys – I’m definitely not cool enough to rock them left, right and centre but hey ho, I’m going to do it anyway! 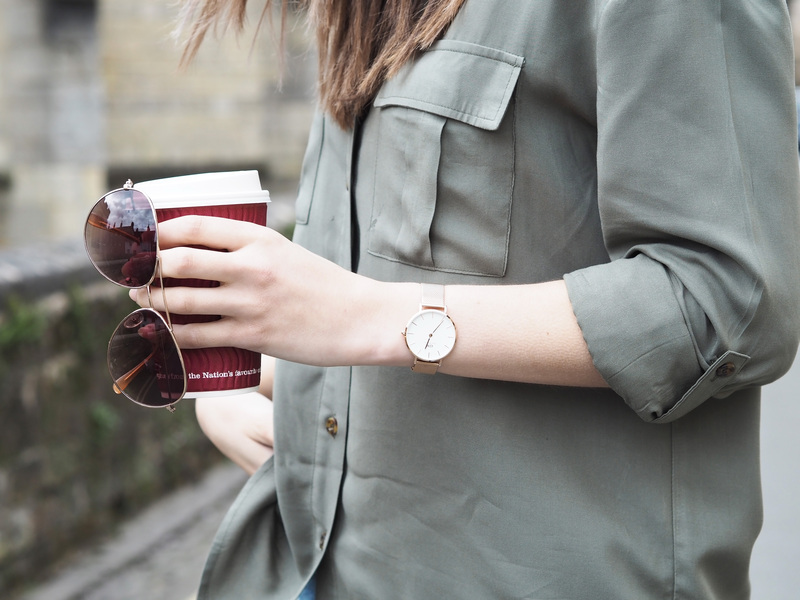 LASTLY, I was super lucky enough to be sent this gorgeous Daniel Wellington watch* and I am wearing it day in and day out, because hello, look at it? Rose gold with a little white face and delicate details. The strap is adjustable, and I’m currently styling it with no other arm accessories, but I’ve got a few I’d like to pair it with, so keep an eye out for that! I have a 15% off code for you guys too – TAMIBEE, go wild! PS – I really need to get my hair cut again, or let it grow now… it’s a bit scraggly but it’s in the awkward stage of AM I GROWING OR ARE YOU TRIMMING ME? Help – what do you guys think?